Affordable and fun to drive, the 2012 FIAT 500 brings small-car European flair and unique Italian styling to North American showrooms and draws on the heritage of the original and iconic 500, which made its debut in 1957. The 2012 500's 4-cylinder engine struggles at highway speeds, the rear seat offers limited legroom, and cargo space is tight in the 500's diminutive cabin. 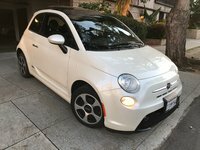 Obviously not intended for every car buyer, the FIAT 500 has managed to carve out a niche in the automotive marketplace as a small vehicle that makes a personal statement, much as the new VW Beetle and MINI Cooper did before it. Thanks to its unique styling, retro interior, wide variety of customization options and sheer fun-to-drive factor, the 500 has endeared itself to many owners. However, a number of owners have reported quality control problems with the vehicle, which in a few cases have caused owners to return their vehicles. Prospective buyers should pay attention during test drives and carefully inspect their intended purchase before being swept away by the 500's uniqueness and signing on the dotted line too quickly. After making its debut in Europe in 2008, the new FIAT 500 subcompact car arrives in North American showrooms for the 2012 model year. The return of FIAT comes after an almost 30-year absence from U.S. showrooms, but given its purchase of Chrysler in 2011, the Italian automaker saw an opportunity to relaunch its brand with the 500 for buyers in the U.S., Mexico and Canada. Built at Chrysler's plant in Toluca, Mexico, the 500 draws retro styling cues from its iconic 500 predecessor, which FIAT produced from 1957 to 1975. 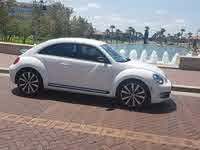 Similar to the VW Beetle, the original 500 was a small, rear-engine car in 2-door and 3-door hatchback versions. The relaunched 500 comes in 3-door hatchback and 2-door cabriolet versions, with a front-engine design and front-wheel drive. FIAT initially offers the new 500 in Pop, Sport, Lounge and GUCCI trim levels, with a performance-oriented Abarth trim due later in the model year. Still sporting a classic Italian design, the new 500 resembles the egg-shaped Beetle in some ways, though its hood stretches a little longer than the Beetle's, and its cabin sits a little further back. Pushing the rear wheels out to the corners gives the 500 a stable stance, with a body that widens from roofline to wheels, resulting in an A shape. The front end displays a cat-like appearance, with the red FIAT logo centrally located, surrounded by chrome "whiskers." The nose juts out over a lower grille opening, resulting in a somewhat aggressive appearance, while rounded sides, pronounced wheel wells, a straight-through side seam beneath the windows and a steeply slanted rear end add a sporty, contemporary feel. Circular halogen projector headlights, lower foglights and chrome exhaust tips are among the standard exterior features across the trim line. All trims except the Lounge also get a rear spoiler, while all but the Pop include front foglights. The Sport and GUCCI also get heated exterior mirrors, while the Abarth displays a more pronounced front fascia, larger air intakes, aerodynamic side skirts, a liftgate-mounted spoiler and dual exhaust pipes. The Lounge and GUCCI have fixed glass tops, and the GUCCI comes standard with a power sunroof. 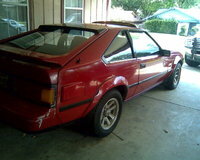 The other trims have hardtops. FIAT also offers all but the Sport and Abarth trims as convertibles with cloth soft tops, which retract at the press of a button, gathering at the rear and leaving the side pillars and windows in place. In bringing the 500 to North American shores, FIAT made a number of improvements over the European version. The automaker redesigned the 500's body structure to meet North American requirements, and upgraded the suspension for better stability and reduced body roll. FIAT also added an acoustic package to reduce road noise inside the cabin and equipped with 500 with a new, efficient 1.4-liter MultiAir engine, which manages fuel economy numbers of up to 38 mpg. In addition, the automaker redesigned the front seats, added a center console, recalibrated the steering system, equipped the steering wheel with cruise and audio controls, added upscale interior features like a Bose audio system and updated the vehicle's heating and cooling systems. Customization options abound with the 500. Buyers can choose from 14 exterior colors, including metallic, non-metallic and pearl finishes, as well as 14 seat color and material combinations. Beyond that, the automaker offers a wide range of accessories by Mopar for further customization options. The 500 seats 4 passengers in its diminutive cabin and fits somewhere between the Smart fortwo and the MINI Cooper in size. Other competitors include the Volkswagen Golf, the Ford Fiesta, the Honda Fit, the Chevy Sonic and the Hyundai Elantra, among many other vehicles in the 500's crowded market segment. While the 500 loses ground against some of its competitors when it comes to performance and ride, it's also more affordable than vehicles like the MINI. Built by FIAT specifically for the North American version of the 500, the new 1.4-liter 4-cylinder MultiAir engine driving the 500 was designed for good fuel economy, smooth operation and low emissions. FIAT says its MultiAir engine technology delivers 10 percent better fuel economy and 10 percent lower emissions than engines without the system. The engine features a Fully Variable Valve Actuation (FVVA) system, which FIAT says is a first for a production engine, and replaces a traditional overhead cam with hydraulic actuation controlled by 4 electronic solenoids for instant air-fuel adjustment, resulting in improved efficiency and power. The engine generates 101 hp and 98 lb-ft of torque at 4,000 rpm. In Pop and Sport trims, it's paired with a 5-speed manual transmission, which comes standard and features new gear ratios designed specifically for the North American market. Optional for the Pop and Sport, and standard for the Lounge and GUCCI, is a new 6-speed automatic transmission with manual-shift and Sport modes. The Sport mode provides quicker gear changes and better responsiveness, and holds gears longer near the redline. When equipped with the manual shifter, the engine posts fuel economy numbers of 30 mpg city/38 highway. Those numbers drop to 27/34 with the automatic. The sport-oriented Abarth trim, named for 1950s-era motorcycle racer and automotive designer Karl Abarth, features a turbocharged and twin-intercooled version of the base 1.4-liter powerplant. It pumps up the hp to 160 and torque to 170 lb-ft for a more spirited driving experience. The turbo engine links to a heavy-duty 5-speed manual transmission with a Torque Transfer Control system and posts fuel-economy numbers of 28/34. 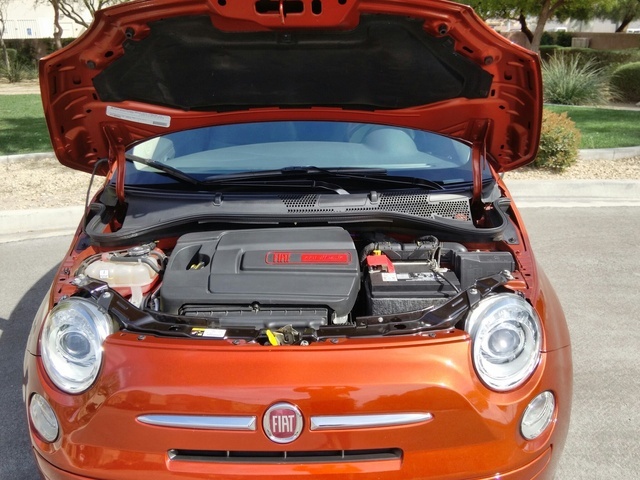 It runs well on regular fuel, though FIAT recommends premium fuel for optimal performance. FIAT also equips the 500 with its eco:Drive application, borrowed from the European version. This PC-based application uses data obtained from the vehicle via a USB drive, and through tutorials and calculations demonstrates to drivers how to operate their vehicles more efficiently and reduce emissions. In addition, it recommends ways to change driving habits. While reviewers say the 500's base engine provides smooth, capable performance around town, with good fuel economy and efficiency, some say it underwhelms at highway speeds and strains when pushed. Buyers who need to frequently travel at highway speeds or require more power under the pedal should consider the Abarth trim, with its turbo engine. Fun to drive and easy to toss around, the 500 generally receives good marks for its responsive steering and solid brakes, although a few testers find fault with both. However, most agree that the 500 makes a great car for daily driving, since it's easy to maneuver on tight streets and in parking lots. Given its small size and curb weight (just 2,363 pounds), the 500 tends to get blown around a little on the highway, especially in areas with strong crosswinds, but overall testers say it delivers a smooth ride at highway speeds, although rougher road surfaces can sometimes be felt inside the cabin. The 500 sits on a MacPherson strut front suspension with coil springs, twin-tube shock absorbers and a stabilizer bar in the front, and a rear twist-beam axle configuration, also with coil springs and twin-tube shock absorbers. The Sport gets upgraded sport-tuned shock absorbers and springs, while the Abarth has a lowered ride height (0.6 inches) and sits on a specially tuned chassis with Frequency Selective Damping front shock absorbers, which operate automatically depending on speed and road surface. The Abarth also has a 40-percent stiffer front spring rate and a beefed-up rear suspension with a unique solid rear stabilizer bar and larger brakes. A rack-and-pinion setup with electric power steering comes standard in all 500 trims, with the Abarth getting uniquely tuned steering for a quicker response. The Pop and Lounge trims ride on 15-inch wheels with all-season tires, while the Sport and GUCCI get 16-inch wheels. The Abarth receives 16-inch cast-aluminum wheels with a race-inspired design. Naturally, given the 500's size, interior space can be cozy. In addition, some reviewers aren't satisfied with the quality of the 500's interior materials. On the other hand, for an affordable daily commuter, the 500 offers a well-designed and attractive cabin, with a quirky design that matches well with the vehicle's exterior styling. A high seating position in front and large windows all around provide an airy feel and good visibility out the front and sides, but testers note blind spots out the rear, due to the sloping roofline and C pillars. Taller passengers will find limited headroom in both the front and back, which diminishes even more with a sunroof, and rear-seat legroom is at a premium. The Italian-influenced interior design has a retro feel similar to the MINI Cooper's, with a unique dash, console and instrument cluster design that makes use of various geometric shapes, including ovals and concentric circles. All gauges in the instrument cluster are located in a single large circular display, and frequently used controls and knobs, as well as the shift knob, sit high and within easy reach of the driver. The dash, doors and cabin also include a number of storage spaces, both large and small. Cargo space behind the rear seats checks in at a minuscule 9.5 cubic feet, but that expands to 30.1 cubic feet with the 50/50-split rear seatbacks folded down. In convertibles, cargo space drops to a paltry 5.4 cubic feet. The rear tailgate has a low lift-over height, making it easy to load cargo. The front bucket seats are supportive and comfortable enough for longer trips, and feature fine details and split-color designs, with the lower portions available in 14 different colors, while the upper portions match the primary black or ivory color of the car's environment. Cloth upholstery comes standard in the Pop trim, while the Lounge upgrades to premium cloth upholstery. The Sport gets sport seats with sport cloth, while the Abarth features well-bolstered front high-back performance seats with sport cloth, accent stitching and integrated side-thorax airbags. At the top of the line, the GUCCI receives leather upholstery. Other standard features for the Pop include a leather-wrapped steering wheel with audio controls, air conditioning, power windows and door locks, remote keyless entry and a 6-speaker audio system with a CD/MP3 player and an auxiliary input jack. The audio system also includes FIAT's BLUE&ME connectivity system with Bluetooth and iPod integration, though some reviewers say the system is tricky to use and iPod integration can be complicated. The Lounge adds automatic air conditioning and a premium audio system with SiriusXM satellite radio, while the Sport gets a sport steering wheel and the upgraded audio system, though without satellite radio. Standard features for the Abarth include leather trim on the dash, aluminum pedals, a performance steering wheel wrapped in perforated leather, a leather-wrapped shift knob, a Bose audio system with a subwoofer and a TomTom navigation system with a 4.3-inch touchscreen. Finally, the GUCCI includes a GUCCI shift knob, GUCCI door panels and the Bose audio system, among other features. The FIAT 500 was named a Top Safety Pick by the IIHS, thanks to its top rating of Good for protecting passengers in frontal, side, rear and rollover crashes. The NHTSA gave the 500 an overall rating of 4 out of 5 stars, which breaks down to 5 stars for protecting passengers in side-impact crashes and 4 stars for frontal and rollover crashes. FIAT equips the 500 with 7 airbags, including a driver's knee airbag. Beyond that, the 500 comes equipped with more than 35 safety features and systems, including electronic stability control, traction control and antilock brakes with electronic brakeforce distribution and brake assist. Daytime running lights and hill-start assist are among the other standard safety features. Styling, practicality, a strong features list and overall value are among the reasons owners purchased the 2012 FIAT 500. They also like the fact that the car stands out from a crowd and has a uniqueness factor, which gets owners noticed. Parking is a breeze, even in very tight spaces, owners point out, and they love its fun-to-drive factor. The manual transmission in particular provides smooth shifting, and the car feels nimble around town. The Abarth's sporty performance gets a thumb's up from owners, and they're very pleased with the vehicle's fuel-economy numbers. In addition, they love the variety of available colors and options. At the same time, numerous owners have reported quality-control issues with their cars, ranging from unaligned glove boxes and easily breakable armrests to open body seams and automatic transmission problems. A number of owners have had to make several trips to the service department, and a few owners have returned their vehicles. But other than that, owners don't seem to have any issues with the 500's small cargo area, cramped rear seat or overall performance. Instead, a majority of owners love their 500s and say the vehicle meets or exceeds their expectations. 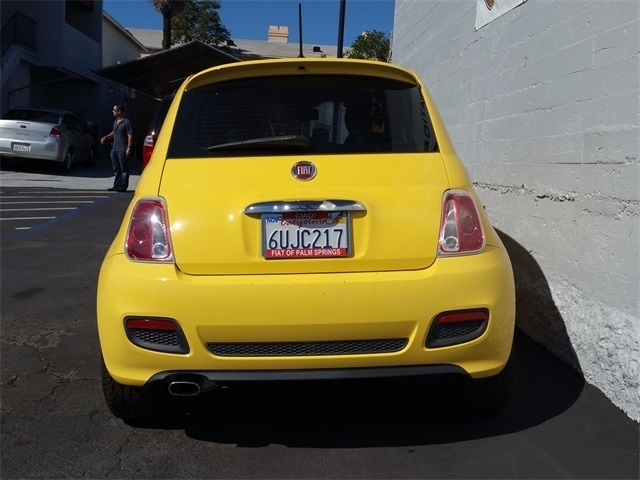 What's your take on the 2012 FIAT 500? djaco Fun, but unreliable. I had little problems here and there, pressure plate in my manual transmission broke at 61,000 miles. Almost 10% of the cost of the car to repair... No assistance from Fiat, but I do have road side assistance for another two years. Have you driven a 2012 FIAT 500?